With December right around the corner, it is also the moment of realization that I am already past the halfway point of my stay. Here are the special moments of my amazing trip. 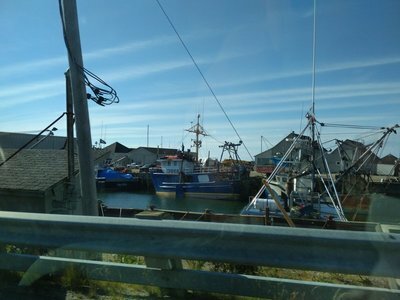 I had some ideas of what live in Canada would be like and there are moments that show what the life of an international student in Nova Scotia is like, both general moments that are for everyone and moments that make my trip special and unique. As you maybe have read in my other blog “An unusual start of October”, I had two very exciting weeks with a highlight every day to start October. After a week like that, you might need a week in which you don’t do a lot and you are able to get some rest. However, this trip is not a vacation, it is the life of a normal Canadian that you follow and you can make is as full and interesting as you want. The week in mid-October was very important for the high school soccer team. We fought ourselves in the play-offs which would end in one school becoming champions of our region. We had games on Monday, Tuesday, Thursday, Friday and the final on Saturday. It was an exhausting week but we eventually came as winners out of a thrilling final. Our school became champions of our region!!! A personal highlight for me was that I had the honour to receive the championship banner, a sort of trophy, as the captain of the team. The first international captain of the Riverview mens soccer team ever. Soccer is not the biggest sport in this beautiful country. That is without doubt ice hockey and my school happens to be pretty good at it. 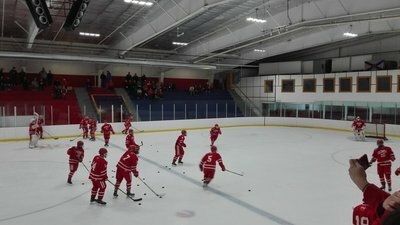 Our hockey team played their home opener the 16th of October, and I do not exaggerate if I tell you that the entire school plus more came to the hockey arena to watch the game. Our Redmen got a very well deserved lead after a great start. The opponents were almost able to tie the game, but the cheering school mates and the perseverance of the team prevented that from happening and the game ended in a 5-4 victory. 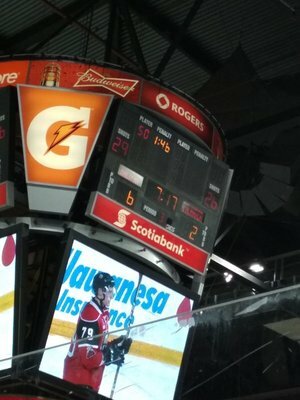 This hockey game was a moment that showed to me and all the other internationals how strong the school culture and school spirit is in Canada. Not only with the Canadians, but they do everything they can to let you as an international join in their fun. Multiple people asked me in the week before the game if I would go to the home opener and that I have to, and that it was going to be great. They were absolutely right. Even though I don’t know the ins and outs of the game, I really enjoyed it and the atmosphere was overwhelming. The next week had four major things for me in store. The first thing was on Wednesday the 25th of October. 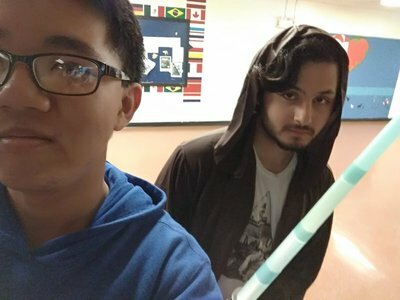 With Halloween a week from then, there was a reason for the school to host a party. We had our dance and everyone, and I mean everyone, did everything they could to not just show up in amazing costumes, but also to make sure that everyone around them was having a fun time and that nobody was standing alone. All those things above are needed for a great party, but the thing that was the most special about this dance was that it was fully organized by students. 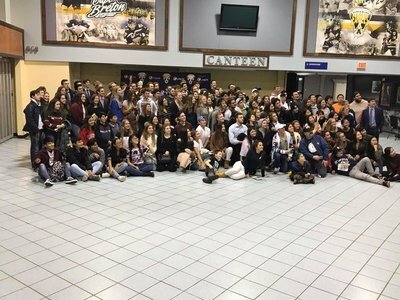 If the home opener was not enough to show you how strong the school spirit is, then the fact that many students gave up their free time to organize a dance for the other students is. 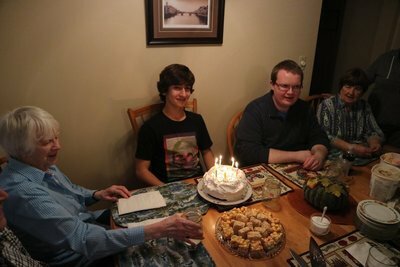 The second landmark was the 16th birthday of my Spanish host brother David. 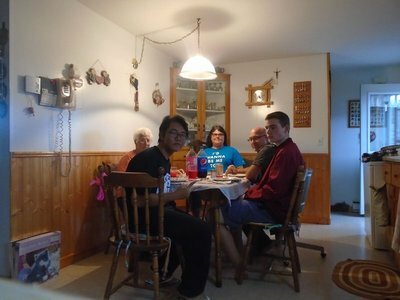 We celebrated it on Thursday with family and friends coming over for supper. It was up to David what we would have for supper, and he came up with the brilliant idea to have steak from the BBQ with homemade fries and a fresh salad. It was our turn after supper to hand him his presents and to make sure that he would have a birthday that he will never forget. The third highlight that week was on the Friday. 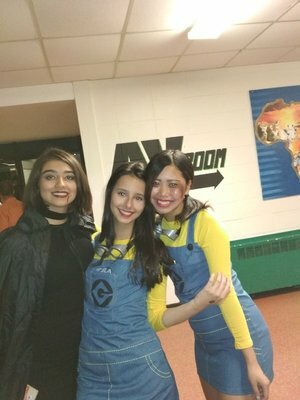 The NSISP, the organization that governs all the international students, had organized a dance similar to the one our school had. People came in costumes and we all had a great time. 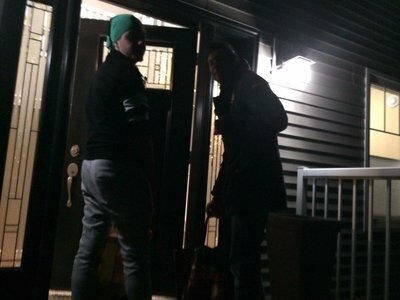 It was long party and at the moment that people got bored and wanted to go home, the NSISP fired their secret weapon to keep the party going. PIZZA. I had to leave the party a bit earlier to get some rest, because I had a vital day ahead of me. A soccer game that would decide if our season would last longer, or would end right away. Our game was against a school from Halifax with over 3 times as many people as at our school. Our job was very simple. 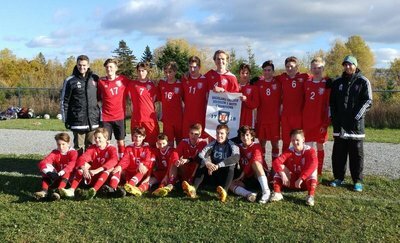 Win and we would go to Halifax for a weekend to fight for the championship of our province. After a very tough and rough game in which we were the better team, we broke in the final ten minutes and lost 3-2. This was a huge disappointment for us, but there was for me one tiny piece of positivity. The tournament would be in the next weekend and I already had something amazing waiting for me in that weekend, but more on that later. We had to hand in our shirts and the season was over. We achieved great things as a team, but most importantly, we were a real team and we enjoyed each second that we were together. Whether it was a practice, a game, or a drive to a tournament. We always found a way to make the best of it and that is after all what this game is all about. The next week was the week in which I would witness one of the most Canadian/American holidays thinkable. It is a day of giving and taking. Whether you give or take depends on your age. Parents give, children take. I am of course talking about Halloween. 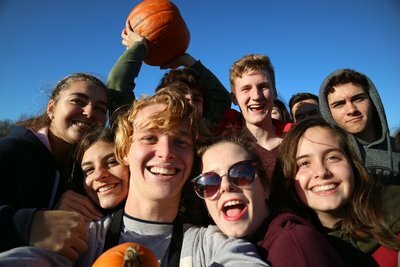 It started for the international students at my high school with a field trip to Hank’s Farm, famous for its corn an pumpkin field. We spent hours wandering around and getting lost in these fields. It was a great experience and we realized that we are a very close group of students. No one was walking alone. The thing that makes this day special is that it is one big contest between everyone. A contest between the families to decorate their house more than their neighbours, between the parents to give more candy than their neighbours, and between the children to get more candy than their friends. I went on the street too, but I thought that I was out of place sometimes. 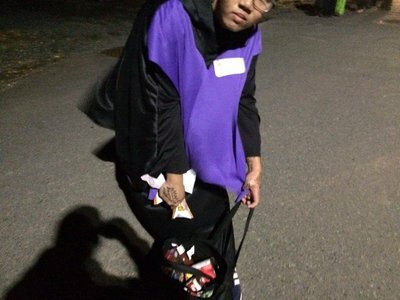 Not necessarily because of my age, but people asked me if I wasn’t too old to go trick or treating with my 192 cm/6’4’’. 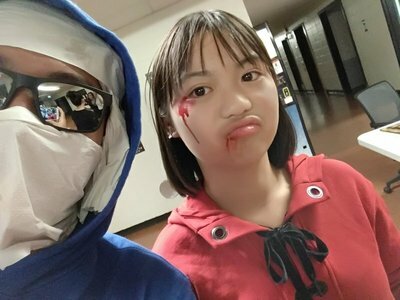 I explained to them that I am an international student, on which everyone responded with a short chat about where I’m from, what Halloween is like in my country and if I like it so far over here. That is what I’ll never forget about my Halloween. 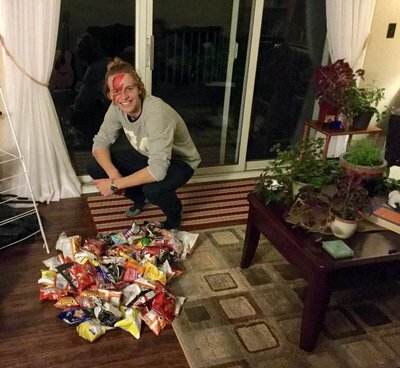 Not the garbage bag filled with candy and chips, not the pain in my stomach afterwards for eating too much, but the kindness of all the strangers I talked with and their enthusiasm about me being an international. Many of them even invited me to come inside and offered me a cup of tea or coffee. It showed me again how kind Canadian people are and why I like it so much over here. As I already mentioned, I would have had the provincial championship tournament this weekend, but we lost our qualifier and I already had something else huge planned that weekend. 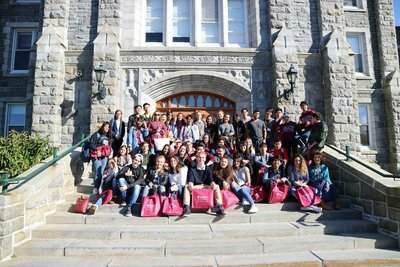 I was as one of the lucky few selected to go on a free 5-day trip through Nova Scotia to see all the universities so that we are able to decide whether we want to go to a university in Nova Scotia, and if so to which one we want to go. This meant that we had to visit eight universities in four days. We were on a very tight schedule and there was not much room to relax, with over 20 hours in a bus. These rides went by in a blink because of the amazing group we had. From a karaoke session, to very good conversations, everything was possible. I can write pages about the great time I had during this mini vacation, but the best way to show this to you all is with a video I made and posted on YouTube with the name “Edunova university trip-Ewout”. The 11th of November is a very special day in Canada. 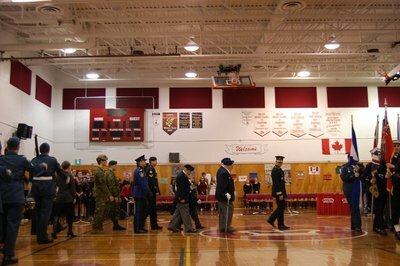 It is Remembrance day. 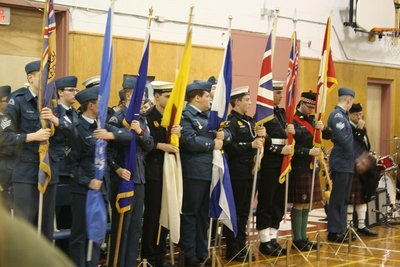 A day devoted to the soldiers who paid the highest possible price for their country and the freedom of other countries. It happened to fall on a Saturday this year, so we had a ceremony at school on the day before. I’ve tried to write down what it was like, but the closest I can get is overwhelming, incredible and breath-taking. There were stories from soldiers who lost their friends, a story of someone who lost his husband and the numbers of the amount of people that went to battle and literally gave their everything. Most impressive is that it often was not for the freedom of Canada, but for the freedom of other countries. I saw a lot banners with Lets we forget during that period and that’s after all what this day is about. To make the sacrifices in the past unforgettable. 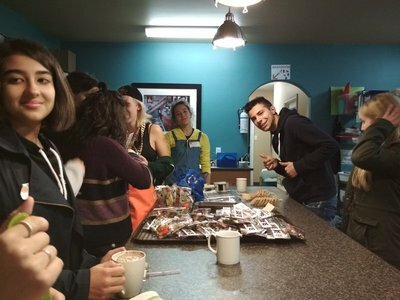 Making moments and deeds unforgettable is also something that I try to achieve during my stay in Nova Scotia and the international group activity planned on the 26th of November helped a lot with that. We first went with all the 150 international students in this area to the movie Wonder, a great and very touching movie. After that, we went to the hockey game of our Screaming Eagles, that ended in a smashing 5-2 win for our Eagles. This was very good, because we had a meet and greet planned with the players after the game. We ate supper together and at the end had time to get autographs and pictures with the local warriors. What were my ideas about life on the other side of the big ocean? My ideas were mostly full with kind people, who are proud of what is theirs and who go big on holidays. I can say that my stay so far confirms all those ideas incarnate. Everyone is kind to you, even if they don’t know you at all. All the Canadian people are very proud of what they got. Proud of their school, proud of their country and proud of what they support, such as their hockey team. The way they celebrate Halloween and remember Remembrance day shows all of those aspects. It is hard to believe that I am already for more than three months part of this beautiful culture and it is even harder to realize that I just have two more months to go here. Time does fly when you’re having fun, but luckily we are able to hit the brake at the really important moments and take our time to realize how unforgettable they are. "Autumn, the year's last, loveliest smile" by William Cullen Bryant, and that is what I described my second month in Canada. Hi, guys is Tony here, my last month in Canada was great, I had a lot of joy and a lot of new interesting experiences. 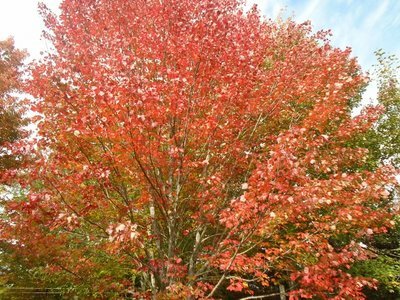 But, right now I'm in my second month, October, and is Autumn, which means it is time for the maple leafs to turn their famous color, red. 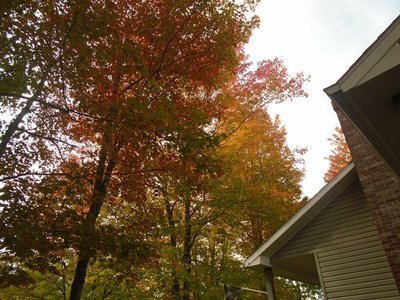 The color that I heard about it many times and for the first time ever, I see a beautiful red maple leaf in my backyard trees, and after two and three weeks, their all turned to one color, and it was a chill experience to me to see all of the leafs, all red and red. In the time when me and my family when to Comeauville, the beautiful town beside the sea, I spend three days in there and it was fun. We're all go shopping and go eat lunch together, it was fun and I also enjoy my first Thanksgiving in Canada, it was wonderful, but it was more wonderful is that I was able to have two Thanksgiving, how fun is that. There is one special event that I forgot to tell you guys, is this event is full of spookiness and scariness. 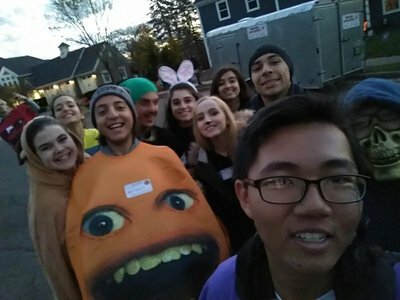 That's right, is Halloween, me and my friends are all pumped up for this event, for me it was my first Halloween, so I was so excited for it. At first, we had a Halloween dance at our school, the dance was wicked, everybody was dressing their favorite costume, that dance night was awesome. 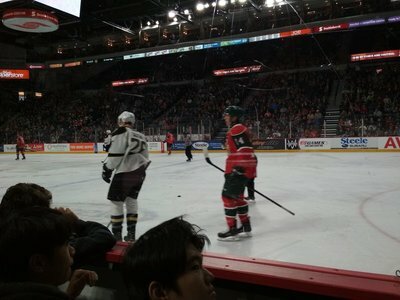 After that, I went to the Hockey game with my friends and other schools in CCRSB. The team that we cheered to is the Halifax Moosehead, they were awesome players, they played against the Charlottetown Islander. 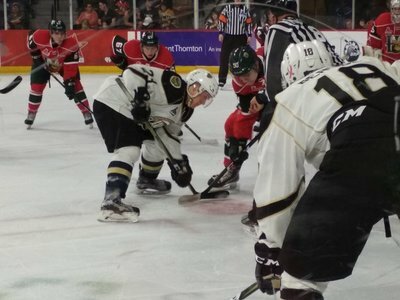 The game was intense, there were so many penalties and so many painful tackles, but in the end, the Moosehead won with the score of 6-2, they left with happy smiles, and the crowd was also happy too. 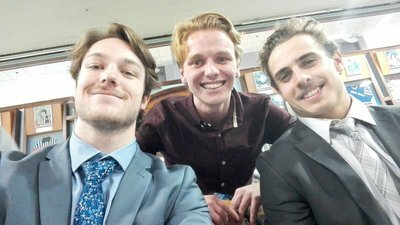 It was so fun to watch the game with my friends and also have some fun at the rink. Finally, the Halloween day has come. 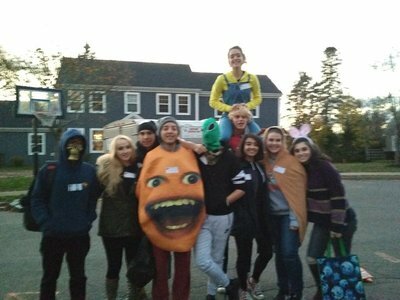 My friends and I were volunteers to go asking people to donate food instead of candies. It was a fantastic night and also cold, we split off into two groups and compete whoever get many bags of food as full as possible, wins. So, the journey began, me and Anna, Domenico and Tommaso and Quang, all four of us went Trick or Eat in the neighborhoods, it was funny and also a great time too, everyone was laughing and talking and also have quite a few of snacks gave by the neighbors, seeing kids with their tiny cosstume with their adult go trick or treating, and also the experience to go trick or treat in the first Halloween night, it was scary to see all of the house we went through, decorated with lots of spooky things. 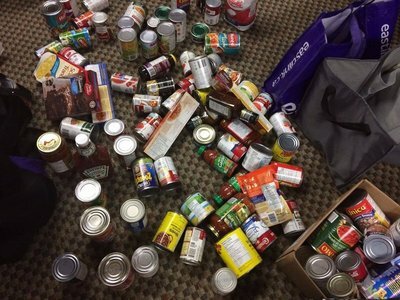 After filling up our bags, we went to the Tim Hortons to meet the others, and so we went to the Food Bank and to donate all of it, the results were fantastic, we donated lots and lots of food, we're all happy and thank you for the people who donate their food to the Food Bank. Exhausted and also cold for a while, we enjoyed our hot chocolate in the kitchen behind the Food Bank where everyone goes there to relax after a long night to go Trick or Eat. After that, we're all went back to the place we met and say goodbye to each other and went home. All of those events was my wonderful time in the second month in Canada, it was great to participate in those activities and enjoy it with family and friends. October has been so far, was my favorite season, well almost. It brings me lots up life experiences and also a joyful time in here, the beautiful view of the maple leafs on trees, the special Thanksgiving time with family, and those great events with friends, all of that was awesome, and it also make myself lots of smiles. 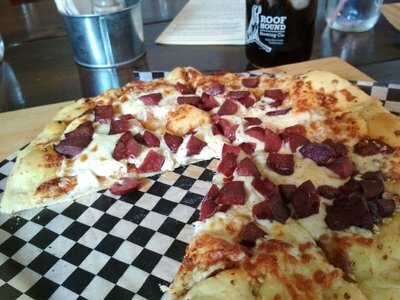 This is my life in Canada, and I will see you in next blog.